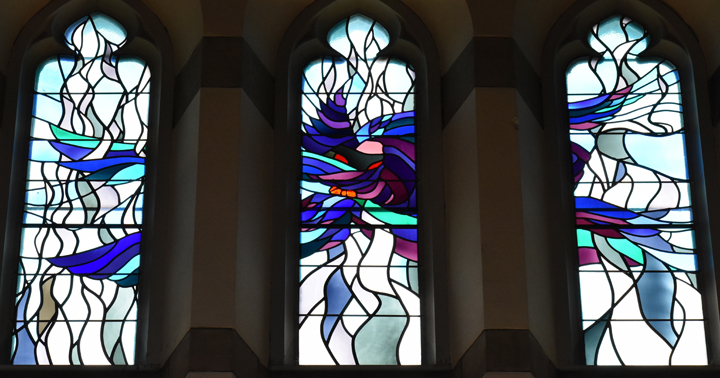 The Isaiah Window calls to mind one of the most striking images found in the Book of Isaiah: Chapter 6, verses 2-8. This visual representation of the six-winged seraphim, in the "house...filled with smoke", with "a live coal in his hand" calls to mind not only this particular moment, but the entire series of images of the "Suffering Servant" which fill the Book of Isaiah, and pre-figure in striking manner the most poignant episodes in the life and Passion of Christ. Isaiah 6:2 Above the Lord stood the seraphim; each had six wings; with two he covered his face, and with two he covered his feet, and with two he flew. Isaiah 6:4 ...and the house filled with smoke. Isaiah 6:8 And I heard the voice of the Lord saying, Whom shall I send, and who will go for us? Then I said, Here I am! Send me.